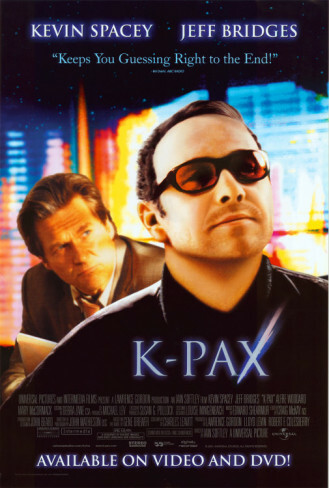 Based on a novel by Gene Brewer, ‘K-PAX’ tells the story of Prot (Kevin Spacey) – a being who claims he came to planet Earth from a mysterious planet ‘K-PAX’ in another galaxy. As a result of his unbelievable statements, Prot is ushered to a mental institution, where he becomes the subject of fascination for numerous patients and for his psychiatrist, Dr. Mark Powell (Jeff Bridges). As time passes and Dr. Powell tries to cure his mysterious patient, he soon realises that he is losing his own sense of what is logical and true. While the film’s premise seems ridiculous and too unrealistic, “K-PAX” should not be judged harshly on that basis, and the film is actually not what it may appear at first glance. The film has many realistic (and dark!) elements, especially towards the end. ‘K-PAX’’s ability to surprise and keep its audience guessing till the very end is admirable, and the film is surprisingly thought-provoking: it unassumingly plays with the audience’s beliefs, feelings and expectations. In some way, ‘K-PAX’ can even be described as a film with depth, because, although camouflaged as ‘science fiction’, it is more of a “psychological conundrum/mystery” movie. From the very first scenes, Kevin Spacey shines, and was in fact nominated for the Best Actor Saturn Award for portraying Prot in 2002. As R.P. McMurphy in ‘One Flew Over the Cuckoo’s Nest’ (1975), Prot is a character who definitely needs an actor with ‘special abilities’ to portray him– not just someone who is great as an actor, but also someone who can portray an ‘out-of-box’ mentality and induce these ‘out-of-this-Earth’ feelings easily and gracefully on screen. Spacey can definitely do this, and much more. Spacey not only manages to confuse all the people in the film as to what is true, but he also manages to fool the audience into believing in his way of looking at the world. Having said that, sadly, ‘K-PAX’ does not stand anywhere near the implicit intelligence of ‘One Flew over the Cuckoo’s Nest’, although it shares some similarities with this film. In both films, one eccentric man enters a mental asylum and revolutionises the place, bringing a sense of hope to its inhabitants. However, unlike ‘‘One Flew over the Cuckoo’s Nest’, ‘K-PAX’ fails to be as convincing as its main character, and this may be because of all the clichés and ‘lazy’ visuals used in the movie. Also, some dialogue sequences in the film, which were designed to inspire and move, actually come across as too-rehearsed, failing to instil a sense of unearthly wisdom coming from somewhere above. Some say that this film is a cross between ‘American Beauty’ (1999) and ‘One Flew Over the Cuckoo’s Nest’. Though this is true to some extent (Spacey did borrow some elements from his character in ‘American Beauty’), ‘K-PAX’ is also quite distinct, sharing some subtle features with ‘Phenomenon’ (1996), starring John Travolta. ‘Phenomenon’ is about a man who has acquired super-intelligence and telekinesis after being struck by a lightning bolt. The reference to extra-terrestrial life, together with inhuman abilities, make these two films seem alike. While ‘Phenomenon’s production appears worse than ‘K-PAX’s, it still provokes deep sentiments which ‘K-PAX’ never quite manages to arouse. This may be due to a more realistic premise used in ‘Phenomenon’. Thanks for commenting. Yes, as its very far from being brilliant – I guess it makes for a nice daytime TV material. Great write-up here. I quite likes this little film. Depite it’s implausible nature, it was quite intriguing. I’m a big fan of both the two leads who were fantastic here. Sounds fascinating; added to Netflix queue. I thought Spacey pulled this along a little on his own. Without him I think it falls very much in the mediocre category. I was expecting much more from this film if i’m being honest. Nevertheless, nice review! I found this film amazing. It gives you hope. It makes you believe. Truly a classical masterpiece.